I’ve always been pretty good about eating my veggies, even as a kid. I would eat basically any veggie except onions, mushrooms, and tomatoes. Obviously, this has all changed because now I cook with them often and I just love the flavor, texture, and color! When my mom would buy brussels sprouts from the store, I knew that they were for just she and I, so it was a little bit of a treat – my dad and brother wouldn’t touch them. But she would steam her brussels sprouts on the stove and then drizzle them with butter and some salt and pepper. Super simple, but oh, WERE THEY GOOD! So imagine my disappointment when I figured out five or six years into my marriage that my dear hubby didn’t like brussels sprouts! WHAT? WHY? What’s not to like? Apparently, he loathed them. I would stare at the fresh brussels sprouts in the grocery store longingly, while he would move right along to other vegetables he would actually eat. I made it my mission to change his mind about these little leafy veggies. It took several attempts, but I finally scored big time with these balsamic roasted brussels sprouts. They have a warm crispy texture from being roasted in the oven with a hint of deep balsamic vinegar flavor. If that doesn’t already sound perfect, it gets better. I toss them with toasted pine nuts and a couple tablespoons of shredded parmesan cheese. Perfection! Mission accomplished. Husband won over. Game, set, match. I win! The end! Life is as it should be. I get to serve my family one of my favorite green veggies, and I don’t even have to fight anyone to clean their plate. Go ahead and serve these little green babies up for a tasty (not to mention healthy) side dish. This simple but "fancy" recipe for tasty brussels sprouts that the whole family will love is warm, a bit crunchy, and full of deep balsamic flavor. Rinse, trim and cut the brussels sprouts into quarters. 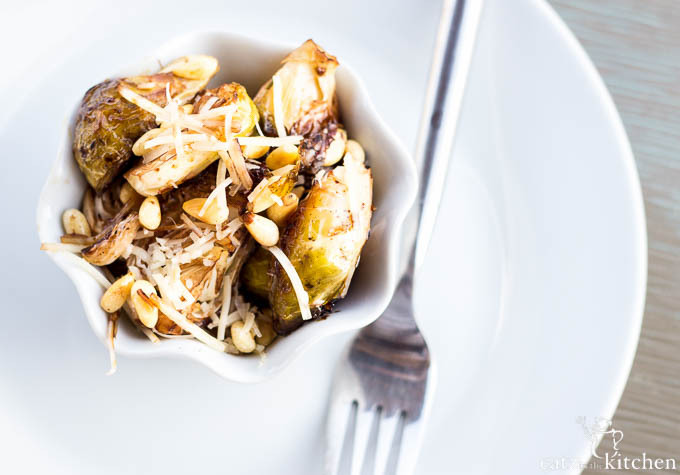 Place the brussels sprouts in a medium-sized bowl and toss with olive oil, and balsamic vinegar. 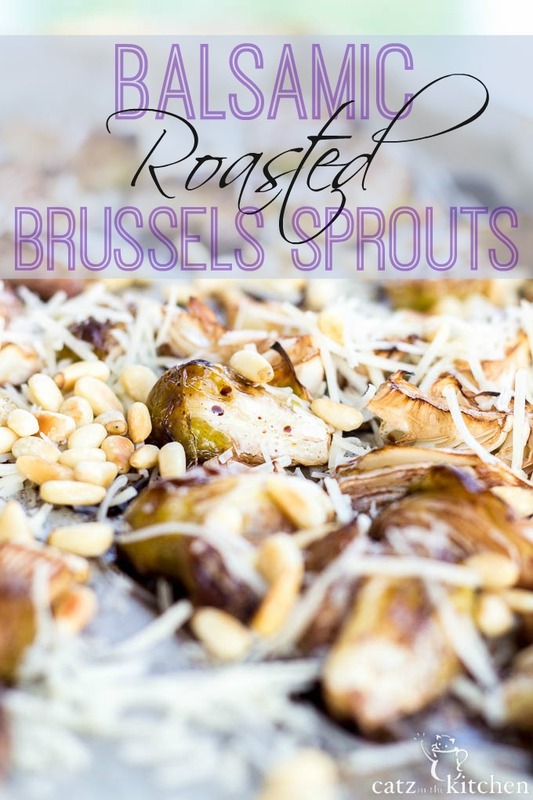 On a parchment-lined baking sheet, spread out brussel sprouts onto the baking sheet and roast for 20-25 minutes. While the brussels sprouts are roasting, add the pine nuts to a small skillet and toast on low-medium heat, just until the nuts start to brown slightly and start to smell nutty, about 5-10 minutes. 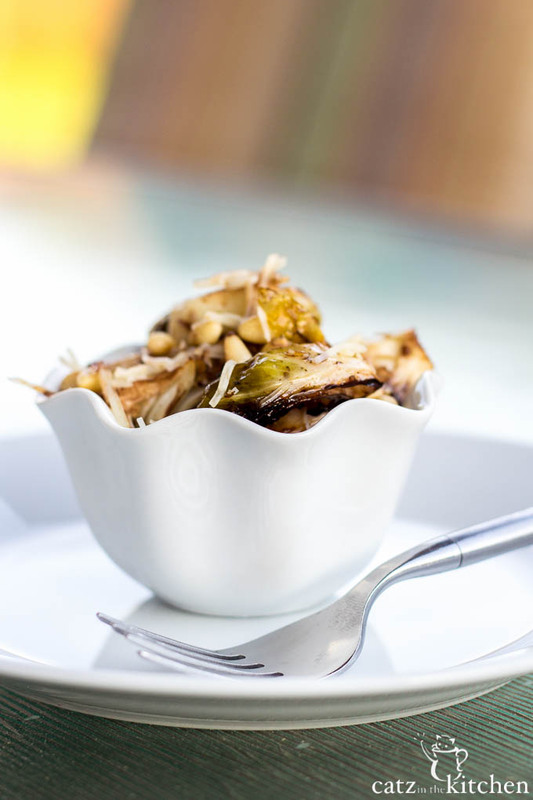 Remove brussels sprouts and serve in a bowl. 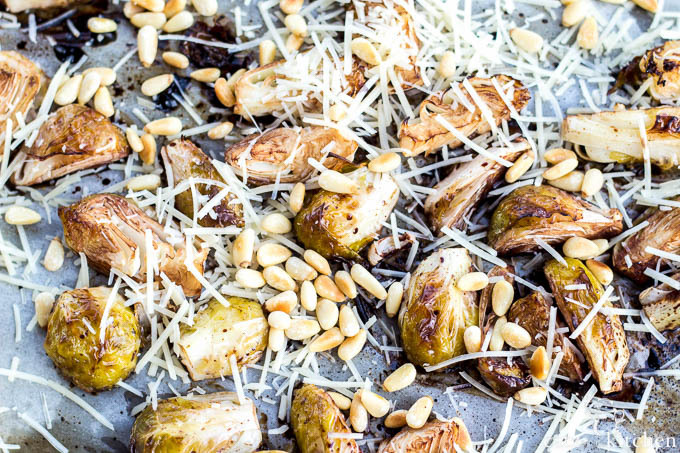 Sprinkle the pine nuts and parmesan cheese over the brussels sprouts and serve. i never tried brussels sprouts as a child...i'm pretty sure cartoons or something convinced me they weren't good. but i love them now! and i'm always looking for new ways to make them, although it's hard to beat olive oil, pepper and salt. but i love balsamic, can't wait to give these a try! They are pretty tasty with the balsamic. But the olive oil, salt and pepper sounds yummy, too!